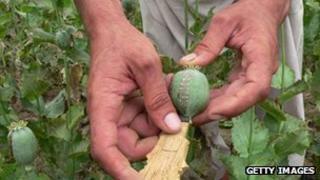 Opium production has risen significantly in Burma this year, the UN says, because farmers lack alternative ways to make a living. The UN estimated that Burma - also known as Myanmar - will end up producing 870 tonnes of opium in 2013. It is the seventh annual rise in a row and keeps Burma as the world's second-largest grower after Afghanistan. The UN cited growing regional demand for heroin and a lack of alternative cash crops in key areas as factors. The increase represented a 26% rise year on year, the UN Office on Drugs and Crime (UNODC) said in its annual Southeast Asia Opium Survey. It was clear, it said, that more efforts were needed to find people alternative sources of income. "Villagers threatened with food insecurity and poverty need sustainable alternatives, or they will continue out of desperation to turn to growing this cash crop,'' UNODC executive director Yury Fedotov said in the report. Production was concentrated in two areas - Shan State, which accounted for 92% of cultivation, and Kachin State, the UN said. Both are border areas which have for years been hit by fighting linked to ethnic minority groups seeking greater autonomy.